^ Novas, Fernando E. Evolution of the carnivorous dinosaurs during the Cretaceous: The evidence from Patagonia. Cretaceous Research. 2013, 45: 174–215. doi:10.1016/j.cretres.2013.04.001. ^ Rauhut, Oliver W. M. Theropod dinosaurs from the Late Jurassic of Tendaguru (Tanzania). Special Papers in Palaeontology. 2011, 86: 195–239. doi:10.1111/j.1475-4983.2011.01084.x. ^ Carlos Roberto Candeiro, Philip Currie and Lílian Bergqvist. Theropod teeth from the Marília Formation (late Maastrichtian) at the Paleontological Site of Peirópolis in Minas Gerais State, Brazil. Revista Brasileira de Geociências. 2012, 42 (2): 323–330. （原始内容存档于2016-03-04）. ^ Rodrigo P. Fernandes de Azevedo, Felipe Medeiros Simbras, Miguel Rodrigues Furtado, Carlos Roberto A. Candeiro and Lílian Paglarelli Bergqvist. First Brazilian carcharodontosaurid and other new theropod dinosaur fossils from the Campanian–Maastrichtian Presidente Prudente Formation, São Paulo State, southeastern Brazil. Cretaceous Research. 2013, 40: 131–142. doi:10.1016/j.cretres.2012.06.004. ^ Coria, R.A.; Currie, P.J. A new carcharodontosaurid (Dinosauria, Theropoda) from the Upper Cretaceous of Argentina. Geodiversitas. 2006, 28 (1): 71–118. ^ Eddy, Drew R.; Clarke, Julia A. Farke, Andrew, 编. 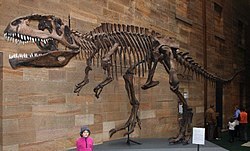 New Information on the Cranial Anatomy of Acrocanthosaurus atokensis and Its Implications for the Phylogeny of Allosauroidea (Dinosauria: Theropoda). PLoS ONE. 2011, 6 (3): e17932. Bibcode:2011PLoSO...6E7932E. doi:10.1371/journal.pone.0017932.